I am told this area where I have been living for the last year and a half here in Korea was once a destination for weddings and honeymooners. That was before more distant and foreign locales became popular. Today one can see here the same kind of multi-story apartment buildings, factories, and rice fields as in many areas of Korea. There are a number of hot springs and spas, though, and one can imagine the bucolic pleasantness of the landscape in times past. The spas remain popular, with crowds of grandpas and grandmas piling in and out of the trains that come this way. Onyang is the most accessible spa destination. A twenty or thirty-minute bus ride beyond Onyang, is another spa town called Dogo, where a number of skyscraper, hotel-spas pop up out of the rice fields. These are hot springs and not just heated water, according to the locals. Several of the mountains around Dogo and Onyang looked like dormant volcanoes to me, because of their conical shape. Everyone assured me, though, that these hills have been asleep since long before human memory. In addition to the hot springs, in the area around Dogo there are a surprising number of venues for tourists, including a 40km hiking trail starting at Dogo Mountain, the Asan Comedy Hall, a Rail Bike venue, and the Asan World Flower Botanical Garden. This last was my destination recently in the search for an escape from winter. Ironically, despite its international flavor, this garden is somewhat off the beaten track for foreign tourists although well-beloved by locals flora aficionados. 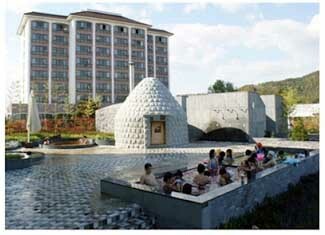 It is a forty-minute walk from the spa-skyscrapers in Dogo. Following highway signs in English and Korean it is an easy-enough destination to find. There is also a bus (#401) that leaves from Onyang (1400 won.) If one is going by foot one should take care in the last quarter-mile or so once the greenhouse comes into view. The road for the cars loops around in a meandering fashion. This leaves the pedestrian tempted to try walking between the fields to find a more direct route. Some of the farmers, however, have left piles of manure and fertilizer around the area that may be hard to spot until too late, as I found out to my chagrin. Asan's World Flower Botanical Garden was a rambling walk through ten or more adjacent hoop greenhouses. This display of flora was a living museum of horticultural prowess, a collection of specimens each with peculiar needs, no doubt. One muses at the feat of maintaining the co-existence of such samples at a single temperature and range of humidity. Furthermore, most of the specimens were directly planted in the ground and many were of superlative size. The first part of the tour led through a restaurant and gift shop area, with a coffee shop as well. The place was truly spotless. The floor fairly sparked. It was amazing, given the amount of dirt involved in gardening. Here the gift shop had a range of plant-based health and beauty products as well as toys, teas, and tote-bags. 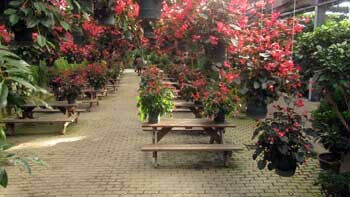 Flower-lovers will revel as well in the nearby garden center that sells many kinds of herbs, decorative plants, and gardening supplies. 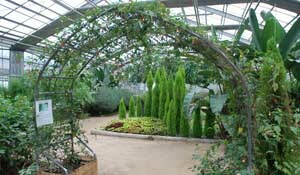 There were also facilities for hosting weddings and other festive occasions in a garden inside another hoop greenhouse. This botanical garden contained over a thousand species of flowering plants ranging from coffee to cacti. Many of the species were previously unknown in Korea such as the camellia, tulip, begonia, and lily. One might imagine that mid-winter the garden would be at rest, but the trumpet vines were blooming overtime and six-foot-tall poinsettias were out in full grandeur. Countless other specimens showed off their flowers. Indeed, I found out there are up to twenty themed annual blooming sequences. Flower enthusiasts should be forewarned that most of the signage around the greenhouse is in Korean, this being a place primarily visited by Korean-speakers. Part of the appeal of the Asan World Flower Botanical Garden is in its out-of-the-way location in rural Korea. Juxtaposed with the surrounding rice fields and a nearby industrial complex, it is a surprise. One minute one is walking through a village of farmhouses, and the next one is transported to a magical garden experience. In winter the contrast is even more striking, compared to the grey-brown stubble of the rice fields outside. In addition, down the street from the garden was a hillside removal project for the building of a factory, and there was a pile of used motorbikes at a parts sales dealership. The fragility of the natural world became apparent in relation to this landscape that illustrated an ever-increasing human impact. Indeed these were reminders of the necessity for human stewardship in maintaining specimens of biodiversity. 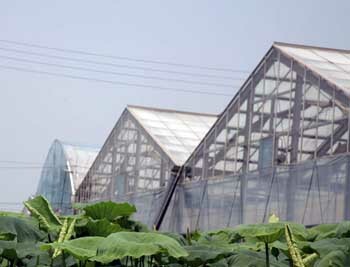 The first glass greenhouse in Korea the Japanese built in 1909 during the occupation period. It was in the Changdeokkung Palace in Seoul, a place known for housing concubines and queens. Apparently, the Japanese also added a zoo around the same time that the city only removed in 1983. In encountering the exotic plants in Asan's greenhouse I found myself considering that global plant trade is not really a new concept, although the ways by which people go about it have developed in new ways. Interestingly, the greenhouse from the Japanese occupation period survives, speaking to the enduring appeal of botanical specimens. Visiting a botanical garden with so many plants from exotic locales, one can imagine the ecosystems where these species grow naturally. In a greenhouse they retain something of their exotic nature in their extraordinary forms, and yet these plants from far away become familiar in the botanical garden. Suddenly their strange foreignness is tamed in these comforting spaces where visitors take snapshots of their children, loved ones, and friends alongside the flowers. It is a kind of silent flower-diplomacy. The bird room is really one to remember in Asan's botanical garden. It is composed of two sizable parakeet aviaries connected by a door, with a small chicken-run on one side. This flock of parakeets is a group of free-flying creatures. 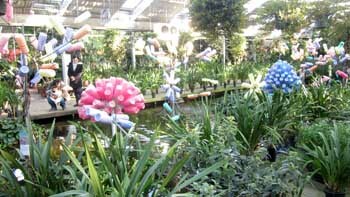 They flit across the spacious rooms like bright green, yellow, and blue flowers. Visitors may purchase small cups of seed to feed them from a vending machine modified to this purpose, and being swarmed by the flock all at once is certainly a botanical garden highlight. After this one must muse on the chickens waiting expectantly at the gate of their pen. Can one not enjoy the banality of the chickens in comparison to the colorful parakeets? Similarly, are not all of the regular plants outside in danger of being ranked below the hothouse specials of the Asan World Flower Botanical Garden? Well enough. In the winter one is happy enough to see anything green, and the variety in this garden was breathtaking.